The psychological health of competitive athletes is of paramount importance to performance, retention, and well-being in sport, and national governing bodies are increasingly concerned with its promotion. Psychosocial Health and Well-being in High-Level Athletes offers students, researchers, and practicing sport psychologists an accessible and rigorous grounding in the manifestations of psychosocial health in athletes, the threats athletes face to their psychosocial health, and the interventions which can be designed to enhance it. Seeking to guide future research and expand professional understanding of psychosocial issues in sport, the book is based on a model of cognitive, emotional, social, and spiritual health. It clearly defines these dimensions in a sporting context before discussing pertinent threats—such as career transitions, injuries and abuse—and interventions, including adversarial growth, life-skill interventions, prevention and organization policy, and mindfulness-based interventions. 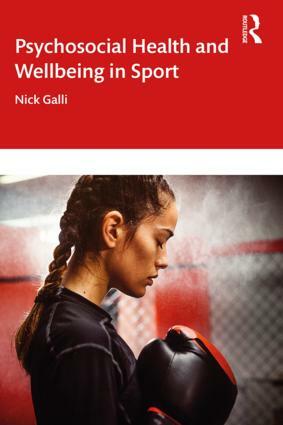 Providing an innovative and integrated perspective on psychosocial health and well-being in competitive sport, this book is essential reading for upper-level students taking any clincial sport psychology modules, and for sport psychologists, coaches and administrators working with competitive athletes. Nick Galli,Ph.D., CMPC is an Assistant Professor in the Department of Health, Kinesiology, and Recreation at the University of Utah, USA. Dr. Galli has authored or co-authored more than 20 peer-reviewed articles and book chapters related to psychosocial health in high-level athletes. He was recognized as a distinguished early career scholar by both the Association for Applied Sport Psychology and the American Psychological Association’s Society for Sport, Exercise, and Performance Psychology. As a practitioner, Galli serves as the mental performance coach for U.S. Speedskating.